As much as it’s important to stay angry and vigilant and not normalize anything about Donald Trump or anyone who advises him, it’s almost important to take care of yourself during these trying times. 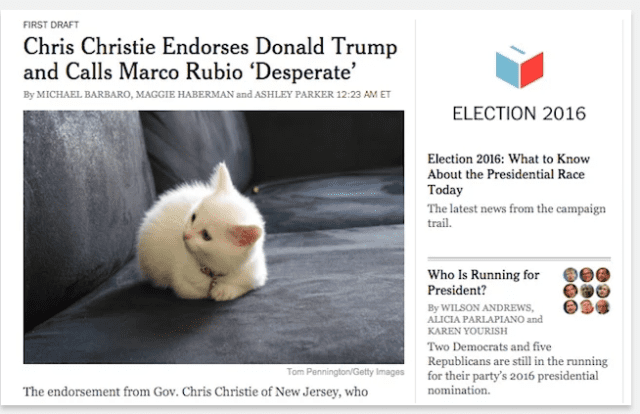 And this Chrome extension that replaces Trump with pictures of kittens is a step in the right direction. This way, you get the headlines and all the terrible news that will still make your blood pressure rise, but you don’t have to look at that smug, orange face. Seriously, if you look too closely at the president-elect, it makes everything worse. The extension is called “Make America Kitten Again” and if you try it on a site like say, The New York Times, where there are pictures of that jerk giving the thumbs up or yelling at a podium on his “thank you tour” all over the place, you really get the full effect. Seriously, try it. It might make you feel better. Maybe. It’s not just pictures of Trump, either. The extension looks for headlines with Trump’s name in them (which is prety much every headline these days) and changes EVERY PICTURE on the website. So, you don’t have to look at Eric’s weasel eyes, or Ben Carson mouth-breathing, or even Kellyanne Conway. They made Kellyanne Conway go away, god bless their souls. Maybe it’s a little immature, but it works. There’s no way to avoid the news these days (and avoiding the news is almost more dangerous than the incoming administration), but if you can tweak the experience, why the hell not. Personally, I prefer puppies, but at this point, whatever helps, right? And this is free, at least. Yoga and wine can get expensive, and spending 10 minutes to sob at your desk every time Trump gives another climate change denier or white supremacist a job might get you in trouble eventually. So, kittens. The creators write on the download page that they created the extension because “Trump is a disgrace, kittens are lovely, and I couldn’t find a Creative Commons photo of a blobfish to use.” So it could have been a blobfish. Not as cuddly, but just as amusing. There are other extensions out there, too, if you somehow hate kittens as much as Trump and his crew. There’s “Make Trump Burger Again,” which does pretty much the same thing as the kitten extension, but uses juicy, delicious-looking burgers instead (complete with melty cheese and bacon). “We like to brighten people’s days, and after Trump’s win we thought we’d create something small to make the internet fun again,” Daragh Kan, co-founder of the burger extension, told Mashable. Well, thank you, Chrome extension creators. You did it.